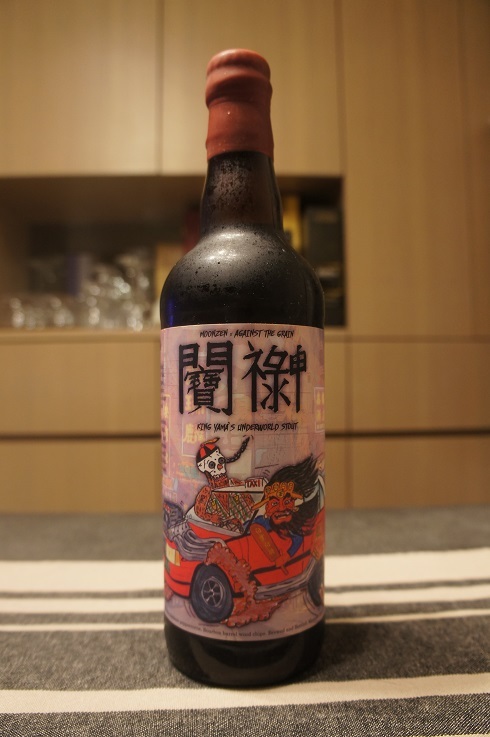 Brewer Description: (from bottle) Dark and Smoke drove too fast, crashed their car and didn’t last. Underworld King Yama reigns, bargains should they live again. Dark and Smoke must brew a stout, tasty enough to let them out! 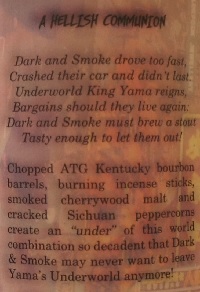 Chopped ATG Kentucky bourbon barrels, burning incense sticks, smoked Cherrywood malt and cracked Sichuan peppercorns create an “under” of this world combination so decadent that Dark & Smoke may never want to leave Yama’s Underworld anymore! Intro: A 650ml bomber with no clear bottled on or best before date. Poured into a snifter glass. Appearance: Dark dark brown to black in colour with a huge three finger dark tanned head that had great retention while leaving only sparse spotty lacing. Aroma: Roasted malts, chocolate, cocoa, oak and floral perfume-y with hints of smoke and Sichuan peppercorn. 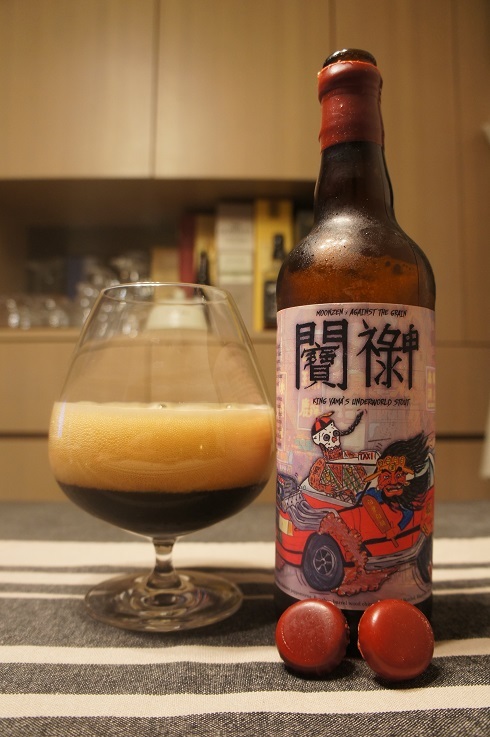 Taste: Quite similar to the aroma with roasted malts, chocolate, wood and that distinct floral perfume-y characteristic. There is an interesting light spiciness that appears at the back of the throat at the end. Overall: This was interesting with its floral and perfume-y character that really stands out, and a surprise positive for me as I don’t normally enjoy floral beers. I actually think that with the aroma, this floralness comes from the Sichuan peppercorns, but unfortunately with the taste, the light tingly spiciness in the background does not appear distinctly as Sichuan peppercorn like it does so well in certain batches of King Yama Sichuan Porter, but nonetheless, still probably better than not having it there. Mainly though, body was too light and there was probably a bit too much carbonation for me, but other than that, with everything else, this is worth a try.